KLH 12's - another hole in my KLH collection filled . .
but they've got the crossovers, tweets and mids in good shape, and I only paid $36 ! I've got a set of 5 woofers in the basement, which will make these guys happy again. has anyone recapped these crossovers ? whats your cap-of-choice ? I have downloaded two photos here, one original crossover and one after modifications. The modified photo is Kent's working crossover, I believe, the earlier one may also be Kent's. Kent may wish to comment on that project. thanks for pix Dan - looks like he used just run o' the mill electrolytics . . .
Hi and congrats on the Twelves. I was watching that auction, too. I think the Twelves are GREAT speakers! Amazing they don't fetch better prices. I'd love to hear an A/B comparison with AR3a's. I bet the Twelves would hold their own! You're right--I did use run-of-the-mill NPEs. The speakers sounded terrible when I bought them, now they sound wonderful. I also have a pair of MicroStatic supertweeters sitting on top--not sure if they are necessary but the whole system sings! Of course, never willing to leave well enough alone, I just bought another pair of external crossovers and am planning to rebuild these with better quality Solens or Daytons, with advice from xover guru Roy C. One quirk with these--they used some dual-value caps and in some cases the dual-values were soldered to the same points. So you don't need 11 caps per xover, only 7. Of course you will have to buy double those amounts to do the two xovers. I also replaced all the wire wound resistors, which in retrospect was totally unnecessary and I do not think I'll do that with the next pair of xovers. edit: I now think it IS necessary. The original resistors are only 5w and I've seen some burned ones. My advice: Use 10w. Restoring the cainets will be another interesting chore. It's been written about quite a bit. And what do you plan to do with the grille cloth? That's 2-layer. Boucle over sheer black. Mine's a little tired looking. Yours looks worse. I'm thinking either Irish Linen like that used on the AR3a or maybe even black knit "speaker cloth." Add a pair of cast metal KLH logos and you're in business! Actually, the more I think about it, I may very well go with electrolytics. They are closer in sound to the originals, and for the 2 crossovers we're looking at about $10 worth of NPEs vs $100 worth of polypros. Even if the polys sounded better (debatable) I'm sure they don't sound TEN TIMES better! Think I just talked myself out of the Solens. I'm leaning that way too .. . $90 is a pretty big difference . . I could buy 2 or 3 tube consoles for that much ! This is one of the most sensible capacitor discussions I have read in a long time (other than the "guru" part...thanks Kent :-)! If you guys want to split the difference, you can try low value mylar caps on the tweeters (maybe even the mids) and electrolytics for high values. Many commercial speaker companies have done this. Mylars, like electrolytics, but less so, appear to have a bit more esr than polys do, so don't feel compelled to tweak the circuit if you are not in the mood to do so. They are relatively inexpensive, and easily obtained from Madisound (Carli branded and "surplus"..the 3uf surplus caps are very good!). The main advantage of this approach is that film caps are very stable for the long term, and that degradation issues are more likely to be bothersome in the upper frequencies. Madisound also sells Bennic electrolytic caps, which have a good reputation. I was just thinking about some of the ebay auctions I have seen over the years. KLH Twelve speaker cabinets sold without the controllers and the controllers sold without the speaker systems. Either way, a headache for the successful buyers trying to find it's mate. You just paid about what the two tweeters alone are going for, good deal. I wonder what a stacked pair of KLH Twelves would sound like? btw--check the "Library" section here and dig down thru the AR section to the "original Models" section, then the "schematics/service" section to the AR 3a restoration document (too bad it is buried!). You will find a lot of useful info there on restoring classic speakers, even tho yours are KLH Twelves. Well worth looking at! (RoyC, who responded to your post, was one of the authors). Good luck and ask questions as you go along. I'm still working on my Twelves. Big monsters, but I love them! btw--check the "Library" section here and dig down thru the AR section to the "original Models" section, then the "schematics/service" section to the AR 3a restoration document (too bad it is buried!). The AR-3a restoration document is pinned for easy access at the top of the Acoustic Research area of this (discussion) section of the forum. Here's another consideration (Roy just alerted me to): The convenient external crossover boxes for the Twelves have limited room. I figure any component (cap) placed inside can have a maximum diameter of about 1.25" The big 50uF polypropylene caps won't fit! Solens are about 1.77" diam and Daytons are about 1.5"
and I have spied the AR3a resto document . . . GREAT resource - I posted it over on AK for all the guys who aren't aware of the goldmine of info here on the Classic Speaker Pages . . I have a pair of AR3a's waiting for love too . . . one woofer rubs, tweeters are poked in, but cabinets are GREAT - should be a quick electro-restoration on those guys. Pulled the off-brand woofers last night - look like CTS . . . I'll post photos when this is finished. So--Here is the completed crossover with the Madisound caps listed above. I'm burning them in now. Could not use polys for the 50uF caps, so I went with NPEs. Any NPE should fit. THANKS RoyC for all your guidance! I seriously doubt I'll hear any difference between the mylars and the NPEs. Will try to sell one pair of crossovers (probably the first pair with all NPEs) when these are finished. Did you see the penciled, on the plywood, serial number, in each of your crossovers? I see that you have different switches looking at the wafers, than mine. Your's look very familiar to me, can't place the manufacturer for the life of me. Long ago, in a far off land, I always wanted to do this, LOL, when the KLH Twelve was being sold, along with the AR-3A's, Consumer Guide Magazine suggested either one as, the very finest speakers available and to judge for yourself which is better for you. There was no mention, that I can remember, now at least, that the Twelves were almost twice the size and weight of the AR-3A's, which might upset the wives a little. The Twelves are about the size of older tv consoles, sitting on the floor, a little too big for the average shelf. My feeling that they do not sell too well, is, that their shipping cost, about $400.00 US a pair, to ship to Canada, size, and lack of recognition compared to the AR-3A's. From some of the bad packaging I have seen with just speaker drivers, who knows what the Twelves might arrive like. I picked up my pair about 12 years ago, for about $100.00 for the pair, locally. I wrote previously about how I accidently discovered them in a pawn shop as I was leaning over the speaker to see the rear of an electronic crossover and wow, there was the crossovers looking up at me. They were attached with their Velcro to the top rear of the speakers, otherwise, I would not have recognized them and would never have seen another pair to this day. They took up the entire back seat of my small van, and they are heavy beast's. In all the years of hi-fi-ing, I have seen 2 pairs of KLH Seventeens in one home and a pair of KLH Nines used in a demonstration in another. KLH was not very well promoted, as I remember, here in Vancouver at least. I wrote a comment earlier about seeing separate speakers and crossovers on different auctions. I can't imagine a buyer, not being rather livid, to find out the the $35.00 speaker system, that cost $300.00 delivered, and damaged, has not got a crossover and they do not come along too often by themselves. I wonder how many owners connect up to the bare rear speaker terminals and play around without knowing what they are doing. I would like to try to draw a schematic of the crossover without CAD. I bought crayons and coloured pencils for the future project. Thank you for the compliments and your comments. Yes--I had not noticed the wafers on the switches, but there is a difference between my all-npe xover and the mylar/npe one I just finished. Interesting note on CR's take on the Twelves vs AR3a's. I don't think the Twelves get the respect they deserve! They are essentially identical to the well-regarded Fives, but with bigger cabinets so they go deeper. That asset is also a liability. edit: The Twelves use different woofers than the Fives. Twelve woofers have double magnets. Missing 3 knobs, terrible sound because of bad caps, a few minor nicks and scratches, tired-looking grille cloth. They now sound great with the new caps. I'm in the process of refinishing the cabinets and patching the veneer in a couple of places. Not sure what to do about the grille cloth. I have the metal logos but have not reinstalled them yet. Your comments about the paucity of KLHs in your neck of the woods is interesting. Of course, in New England they were very common. I notice a lot of Dynaco speakers on ebay come from Canada. Guess Dynaco did a better jo of marketing up North! Yes--the speakers are sometimes sold without the crossovers. Hard to imagine, unless buyers are opting for external electronic crossovers. Expensive, but probably nice. As I mentioned, I plan to sell one pair of crossovers (don't need two!) so I hope I can recoup the cost of the caps and knobs. Originally I had bought some nice inexpensive retro-style knobs in Rat Shack (shown in one of my previous posts), since 3 of the originals were missing. But the second pair had (only) 3 original knobs, so now I have one complete set! Could have used that schematic! Maybe then I would have bought the right number (and value) of caps! Here's a photo of one Twelve. Not finished yet. The xover was moved for the photo but is normally attached to the back with Velcro. More work to do on the finish. New cloth needed. Reinstall logos. Too bad these are in the hall OUTSIDE my rec room! regarded Fives, but with bigger cabinets so they go deeper. That asset is also a liability. probably nice. As I mentioned, I plan to sell one pair of crossovers (don't need two!) so I hope I can recoup the cost of the caps and knobs. Originally I had bought some nice inexpensive retro-style knobs in Rat Shack (shown in one of my previous posts), since 3 of the originals were missing. But the second pair had (only) 3 original knobs, so now I have one complete set! Nice looking setup as is, Kent. The magazine was Consumer's Guide not Consumer's Report, and I believe that magazine is still being published. I bought a few issues off the local bookstore shelves. I do not know what Consumer's Report commented about the KLH Twelves. At about that same time period, that magazine, GG, or at least Micro Acoustics or AR, published a photo of their reference speaker system, used to compare to other brands. They used an AR-1W woofer system, Janszen 1-30 Electrostatic Arrays, and MicroStatic Tweeter Arrays. I was very fortunate to be able to write a rubber cheque so that I could borrow a pair of the Janszen's and MicroStatics for a weekend. I already had my pair of AR-3A's on hand for the woofers, which may have been a better match, with the lower woofer crossing over to the Janszen's. I was very impressed, not the former wife though, with my AR amplifier, Simon and Garfunkle never sounded better, I'm sure my neighbours hated me that weekend at least. Dynaco was heavily dumped here, at rock bottom prices by two store chains. Dynaco A-25's at $52.00 CDN each, limited to two pair in that store at door opening, mind you. My big bros was there at door opening to see. I think that hifi like so many other products, if you don't offer spiffs, exclusivity, or huge profits, you don't get the shelf or floor space. The very first hifi system I ever bought was in 1965, as an adult, it was not very good, I was suckered in by a dis-reputable salesman, he was very good and experienced at it and I was not. A week later, I was downtown, AGAIN, with Consumer's Report's in hand, AGAIN, and I heard a very large, clear speaker system in another store. A wall of speakers, perhaps 20 - 30 mixed pairs or more, were facing me. The large speaker system was in fact, the AR-4X's, sounding much, very much larger than it's diminutive size. That started my hifi bug, even moreso. At just over $1.00 per hour as an apprentice, I was already financed to just under $600.00, so it was a few years before I could see my way to upgrade anything. Even though I was interested in AR , AR had quite a battle with the poor commissions, badmouthing and profit margins being offered. I bought crayons and coloured pencils for this future project. I will be using Carl's hand drawn schetch of the KLH Five crossover as a starting example to follow. There is also a CAD drawing, in the library, of the KLH Five crossover, that is first class. I do not have a CAD program. I've heard some good things said about the 12, but have never had the opportunity to hear them myself. The deeper bass response and more elaborate tone controls of the 12 should be advantages over the 5. Anyway, it all looks very nice! I'll be interested in your audition of the new crossovers! I'll be interested in your audition of the new crossovers! As requested by some readers, here are my impressions of the recapped KLH Twelves we’ve been discussing. I used mylar caps from Madisound, except for the two 50uF bass caps. Polypros would not fit in the box so I used NPEs. I do not have “golden ears.” Never did. And as I face my seventh decade (yikes! ) on the planet this year, my ears may be headed toward tin. This “test” was not at all scientific. Not double-blind. The listening rooms were not set up right. The “panel” consisted of one listener. 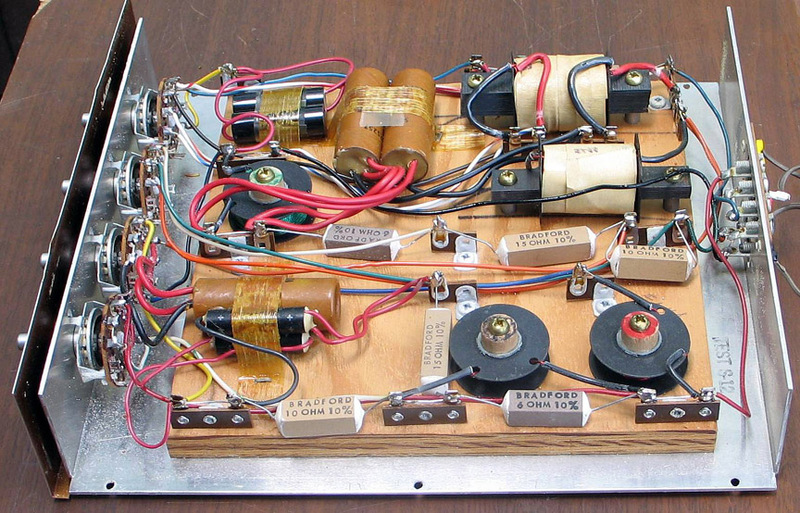 A vintage AR amp that was recently refurbished. A pair of AR2ax speakers that I restored 1½ years ago. New foam surrounds, new Zen polyprop caps, cleaned up original pots. New Irish linen grille cloth. KLH Twelves. All original drivers. Original grille cloth (boucle over sheer black). MicroStatic supertweeters on the Twelves. Plain ol’ 16 ga speaker wire. I chose these in order to get a range of relatively unprocessed sound (I love classic rock, but Layla won’t reveal the accuracy of the speakers). Jazz at the Pawnshop may be the single best CD for evaluating speakers—intimate acoustic instruments carefully recorded with minimal processing. Passion Grace & Fire has some excellent acoustic guitar. Orchestral Spectaculars includes, well, spectacular orchestral pieces such as the Sorcerer’s Apprentice and Les Preludes. Carly Simon was selected for female vocals and Mozart….’nuff said. The ARs are in my rec room on shelves, about ear level. The KLHs, unfortunately, are relegated to a hallway that measures about 6’ x 25’ with about a 6½’ ceiling. The KLH floor speakers are on one of the long walls but only about 8’ apart. Far from ideal. I played selections from the CDs listed, walking from the rec room to the hall and back to compare the sound. I like the AR2ax’s. A lot. But it seemed to me the KLH Twelves were more detailed. I’ve heard reviewers say “it was like a veil was lifted” and I was always skeptical, but that’s exactly the effect. The tambourines on Pawn Shop sounded like they were right there with the Twelves. The guitar picking on Passion… had a cleaner “attack” through the Twelves. The bass response was better through the Twelves, but they have about double the cabinet volume of the ARs. I don’t have all the lingo, but overall whether it was vocals, instruments or orchestras, I found the Twelves more accurate. I probably should have tried the Twelves without the MicroStatic supertweeters—maybe some other time. The one big surprise came when I reconnected my original, all NPE crossover to one speaker and left the mylar capped crossover on the other. I switched the AR amp to “mono” and compared the sound from the 2 KLHs. To my ear, the all-NPE sounded a little better. Hard to put my finger on it, and I don’t have the reviewer’s lingo, but I thought the NPE xover provided a bit more “shimmer” that was pleasing. Thank you for your speaker/music review. Maybe you can report back when the MicroStatic's are not in use, please. The tweeter used in the KLH Twelve and other KLH models was always well received in reviews, as I remember. Maybe not perfect, it is a dynamic tweeter and not an electrostatic tweeter. Certainly speaks well of it's solid design and range, when it is used in more than one model KLH speaker. 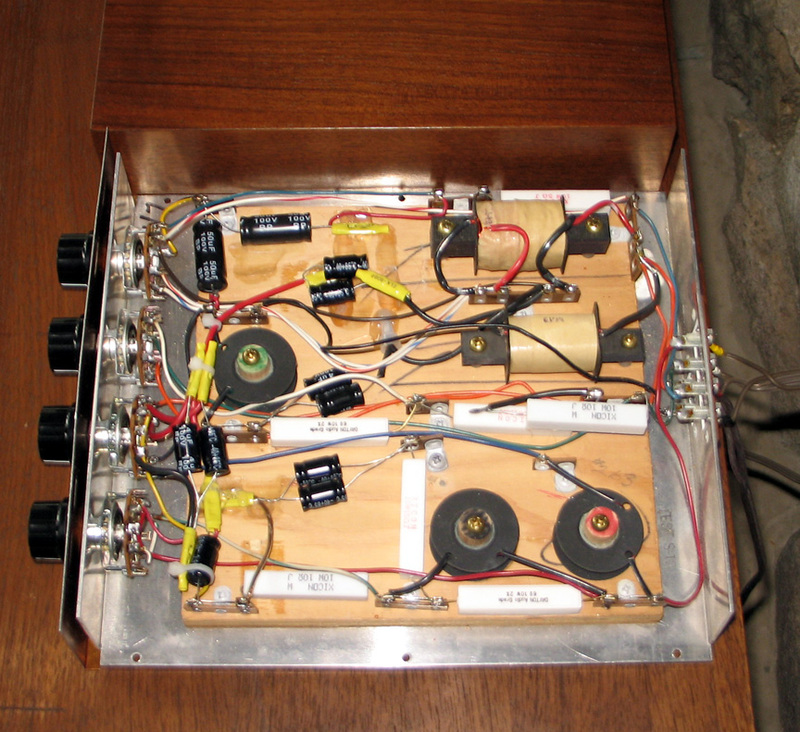 The model 12.5 mids, were full-range when used on their own, or as midrange drivers in tandem, as used in the KLH Fives and Twelves, which required separate sealed sub-enclosures for them. Pretty amazing feat for such a small driver with only a cloth surround. The same woofers, also only with cloth surrounds, were used in the KLH Twenty-Three's, Five's, and Twelve's, attesting to their robust construction, as well. With KLH doing their in-house driver manufacturing, their quality control was very tight and positive. With the floor standing cabinet's each being 29" high x 22" wide x 15" deep and not too much under 100 pounds each, it was fighting the WAF. Being a floor standing speaker and twice the size of the AR-3A's, it does appear that an instore display would have, in most cases, be against the size of the KLH Twelves, against the smaller and shelf friendlier AR-3A's, nevermind sound comparisons. Yes, it would be nice to have a battle of the speakers, so to speak. An AR-3a vs KLH Twelve and AR-5 vs KLH Five friendly battle, would make for an interesting and entertaining comparison. Yes, the KLH Twelves can be wall mounted, with special re-inforcements. They can also be stacked. Does anyone have a copy of the KLH Twelve owners manual/brochure? Does anyone have a approximate number manufactured? Sorry to hear of your accident. If you look on page 1 of this thread, you'll see the saga of the 2 pair of crossovers I recapped. I'm retired and like to work on these for the fun of it. I would be willing to rebuild yours. No labor charge--just pay for the shipping and the parts.